Although not being superior in all details that make a mobile casino, Superior Mobile Casino surely has many features that make it a very respectable place for South African mobile players. Rival Gaming has provided this casino with numerous games you can play in both, real money and practice mode. This casino targets an international market, but gives special attention to South Africans and treats ZAR equally with US$, UK₤ and EU€. This casino offers a no deposit bonus if you want to try out the games for free and a massive welcome bonus of R40,000, among other generous bonuses aimed for new and existing players. Superior Mobile Casino has a really nice and handy platform provided by Rival Gaming that will inform you correctly about everything that the casino offers and enable you to browse through the casino easily. A sticky menu at the bottom of the screen provides instant links to the games, banking and customer support. A big red button at the top takes you to the games, whether you like to play for fun or for real money. This means that there is no need for another application since you can play the games directly from the mobile browser. Rival Gaming provides attractive, modern games that are based on random number generators to ensure fair chances for all players. An up-to-date software technology protects all the players and keeps their data safe from the intruders. With around 60 mobile games, Superior Mobile Casino gives you a chance to spend many hours playing excellent 3-reel and 5-reel video slots, as well as few table games and scratch cards. Having in mind that classic slot fans are usually ignored by the majority of mobile casinos, they may find a sanctuary at Superior Mobile Casino, because Superior Mobile Casino features more than 20 various 3-reel classic slot machines. Those who prefer visually more attractive slot games should not look further as well. Many 3D and interactive video slot games with excellent graphical solutions, captivating story lines and dynamic bonuses can be played as well. When it comes to table games, however, Superior Mobile Casino is not so abundant, though blackjack, European roulette and American roulette can be found in the casino’s game lobby. On the other hand, scratch cards play a big role at this casino with half a dozen various games. The entire mobile casino can be accessed over mobile browsers such as Safari or Google Chrome, so there is no need to download and install any application. Superior Mobile Casino is optimised for smartphones, blackberry and tablets run by Android or iOS operating system. Having in mind that majority of the players belong to Android and Apple users, Superior Mobile Casino is available for most South African players. 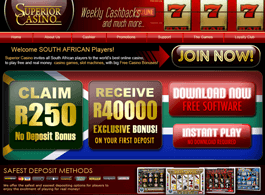 A nice R250 no deposit bonus is something every new player can get the moment a signup process is over. The wagering requirement of 20 times the bonus amount is not a big deal, but the maximum cashout of 2.5 times bonus won’t blow anybody’s mind. However, this seems like a nice gift to get started with the games while not spending a single Rand of your own money. Slot fans will be privileged with an amazing welcome bonus package they can use on slot games only: 1st deposit welcome bonus can go up to R35,000, while the 2nd and third deposit can be awarded up to R15,000 and R5,000 welcome bonus respectively. Superior Mobile Casino features a loyalty programme and if you show your devotion to the casino they will treat you to special promotions, free chips, gifts, Superior Points and more. The loyalty programme consists of 4 levels: Special (default level), Club, Premium and Elite. All transactions with Superior Mobile Casino should go smoothly, since this casino offers several banking options that have proved reliable and convenient for all kinds of transactions, especially for mobile users. As usual, you can use your Visa or Master card in order to make a deposit, as well as receive a withdrawal. However, electronic wallets such as Neteller, Skrill and EcoPayz are at your disposal too and you should use them if you want fast transactions that won’t last more then two working days. Additionally, the players can use UPayCard, UKASH and a couple of other payment methods. Superior Casino gives a variety of options to the players that want to get in contact with the casino’s staff. The toll free mobile phone is available internationally and do not hesitate to call a client services representative 24/7. Additionally, you can send them an email with all information you need as well as problems you may experience with the casino. Superior Mobile Casino is supplied with various casino games you can play wherever you go using nothing more than your Android smartphone or tablet, iPhone or iPad. South African mobile players are free to use the South African Rand for all transaction and a variety of banking methods give them many solutions to process the payments easily and safely. Players who prefer classic slot machines have a very nice selection of 3-reel slot games, but even if you prefer cutting-edge video slots you will find your cup of tea.